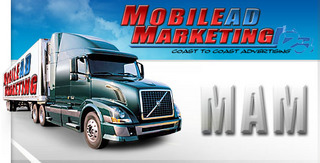 Mobile Ad Marketing was started in January of 2005 to sign up and manage Trucking Fleets for the purpose of third party advertising. The Trailer AD space is then sold to MAMs' affiliated Advertising Agencies and directly to Companies. Mobile Ad Marketing is also in charge of trailer tracking, scheduling artwork application, and AD maintenance for the campaigns. In 2000 Daniel Sage started his own marketing company. Within a year he was featured on the Entrepreneur Magazine website for his new marketing system. He is now dedicating this knowledge and mastery of marketing to the world of Fleet and Mobile Marketing. Bryce Rakich is the Co-Owner, Managing Partner and the Sales Voice of MAM. MAM operates out of Las Vegas, NV. MAM offers over 500,000 trucks across the country. The trucks are dedicated routes 12 hours a day, six days a week.